You are currently browsing the tag archive for the ‘Street trees’ tag. 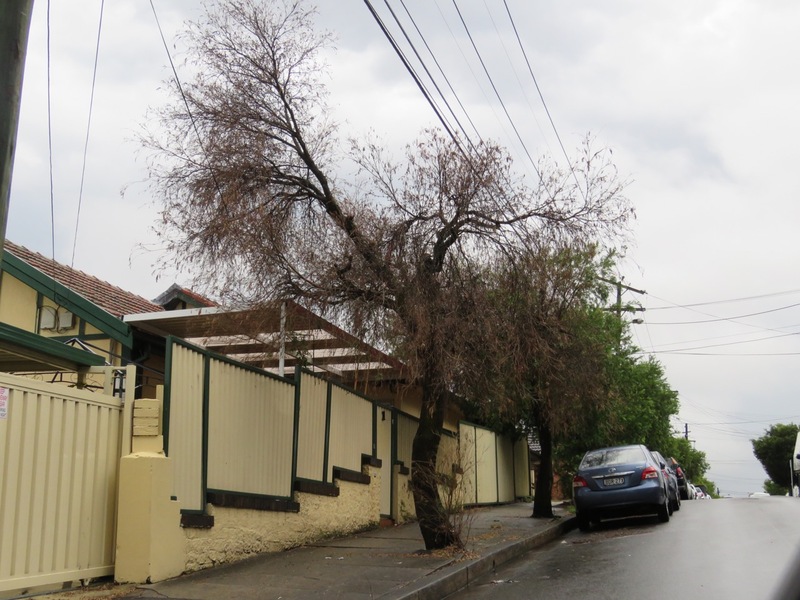 Two dead street trees right next to each other in Marrickville – notable because they are beside each other. My last post was about the NSW government’s ‘Five Million Trees’ initiative. 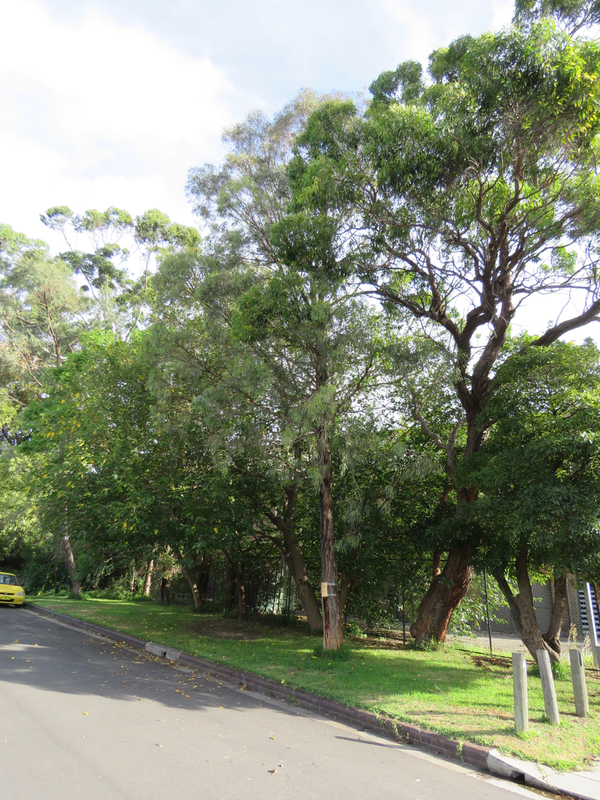 See – https://bit.ly/2H2IEkz The aim is to increase Sydney’s existing tree canopy from 16.8% to 40% over the next 12 years at a cost of $37.5 million over four years. The article looked at tree survival across US cities. Research has found that, despite concentrated campaigns to increase the urban canopy in many major US cities, the canopy cover is actually declining. This is of major concern considering the extra pressure we have from increased development, a changing climate & its associated urban heat island impacts. “With major new planting campaigns, how many of those trees will survive for decades, reaching a mature size at which their environmental and socioeconomic benefits are greatest? How many trees are enough – that is, how many need to be planted to make a lasting impact, and meet a city’s canopy cover goals? As part of their 5 Million Trees initiative the NSW government plans to give away 15,000 trees to people who are building homes in new land release areas in Western Sydney. I wonder how many of these trees will actually be planted. I don’t know about you, but I have bought plants from the nursery & left it too long before I put them into the ground. One can realistically expect that high numbers of these giveaway trees will not be planted in western Sydney. 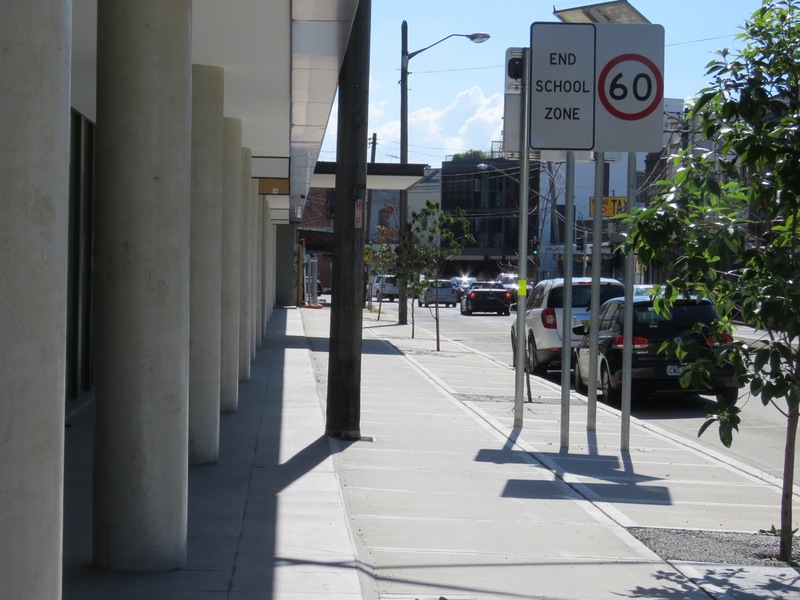 Will these be acknowledged, or will they just be written up as a successful addition to the urban canopy simply because they were given away? The Inner West Council has given away trees for the past two National Tree Days & I applaud them for this. It would be interesting to know whether Council has gathered information about how many of these trees made it into the ground & how many are still alive today? The article notes that in the US there is very little in regards to monitoring & follow-up with tree planting campaigns & calls for a nationally coordinated monitoring network. One only need to look around our own suburbs to know that there are plenty of streets with street trees that are 70-100 years of age. Generally, these are QLD Brushbox or Fig trees. A study to understand the change in the street tree population of West Oakland in the US looking at annual tree planting & tree deaths found that the annual mortality rate was 3.7%. Most of the tree loss came from newly planted trees with a trunk of 7.6cms (3 inches). I think this article brings up serious issues concerning increasing the urban forest. 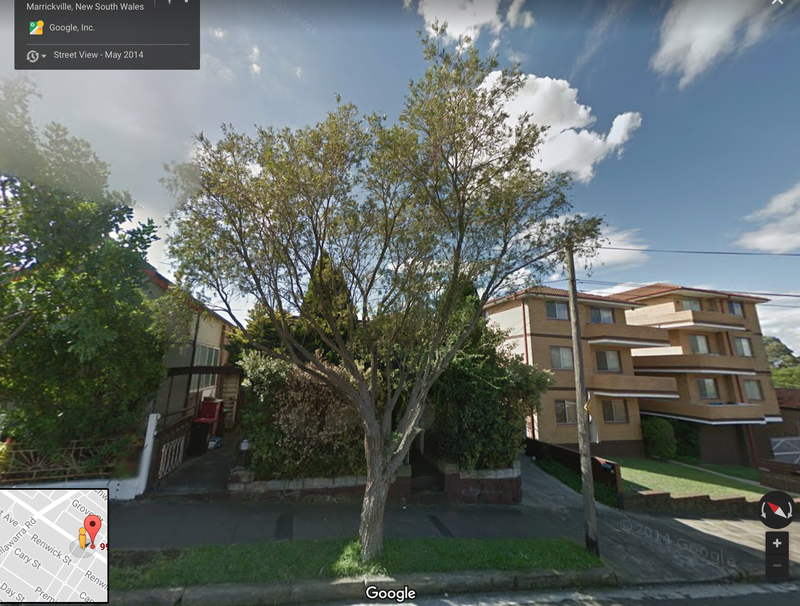 I’ve noticed that street tree removals post Marrickville Council’s Tree Inventory meant that for at least 3-4 years the urban forest numbers stayed relatively the same. With 1,590 streettrees to be removed from 2013, planting around 400 new trees a year meant that making up ground was slow. I have noticed that a lot of street trees have been removed in the last couple of years. 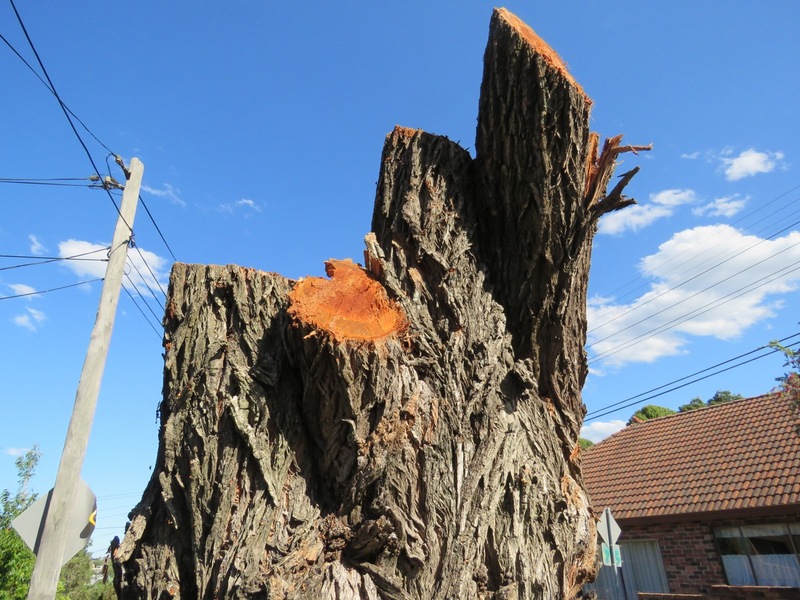 Since Council does not report the removal of trees 5-metres or under & since 49% of our street trees were found to be 5-metres or under, we have no idea where street tree numbers are at now & no ability to calculate this ourselves. The Tree Inventory was costly, so I doubt we will have a new one done for many years. This has an impact on the way Council prune street trees as well. Continuing to remove side branches that serve to make the tree canopy fuller & produce longer periods of shade is counterproductive – unless it is required for safety reasons like branches over the road affecting passing trucks as an example. However, you only need to look at the street trees around you to know that many street trees are pruned to have no side branches. Council’s policy of no tree branches 2.5-metres (8.2 feet) above a footpath pretty much ensures that the footpath will have no shade except for perhaps an hour when the sun is in the right position. The Five Million Trees initiative may result in significant changes with tree planting & reporting. It would be good if this information is available to the community should they be interested. Hopefully, outdated ways to manage street trees get dumped & our urban landscape becomes green & flourishing. 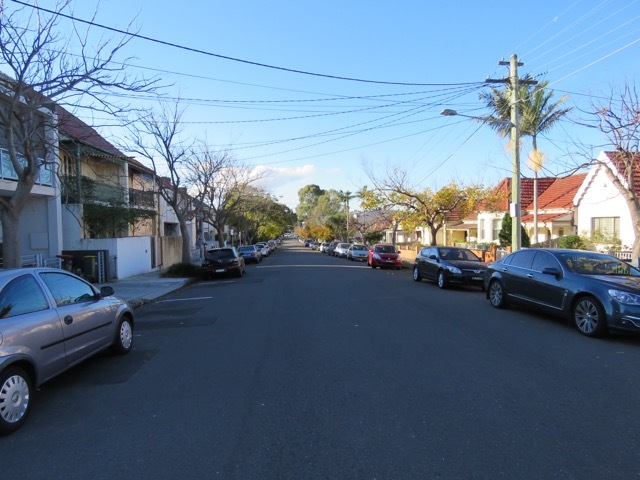 A Marrickville streetscape – a good one because it has street trees 2 storeys tall. Photo June 2016. The tree to be removed. 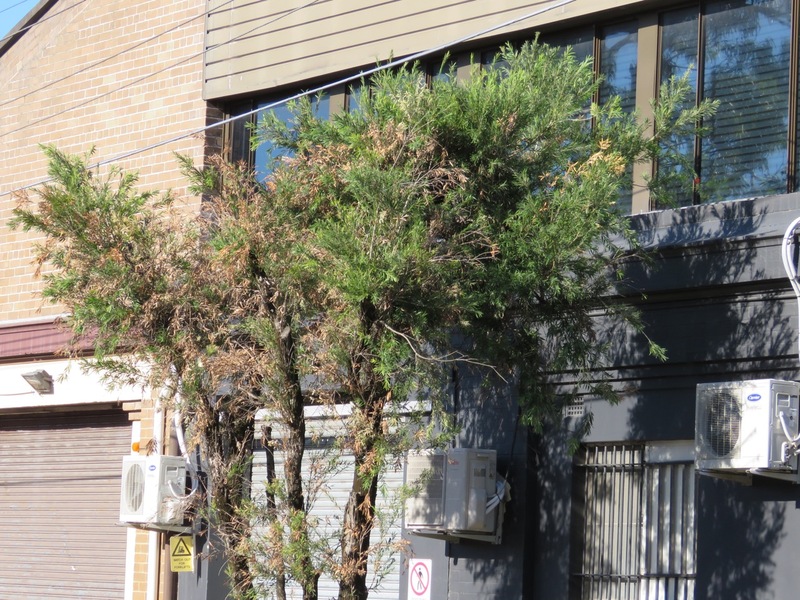 Inner West Council – Marrickville have given notice that they intend to remove a Small-leafed peppermint (Eucalyptus nicholii) outside 80 Denison Road Dulwich Hill. “The tree is in poor structural condition, has recently suffered a significant branch failure and exhibits extensive stem decay which cannot be mitigated by pruning. Council say they will replace with a Yellow bloodwood (Corymbia eximia) in the 2018 planting season. There was no Notification of Removal on the tree. Yellow bloodwood is an Australian native with a round canopy that grows to 10-metres. It has scaly yellow-brown bark & broad, thick, curved, blueish-green leaves. In spring, it produces large clusters of creamy flowers in clusters, which attract birds & insects. Nice choice. 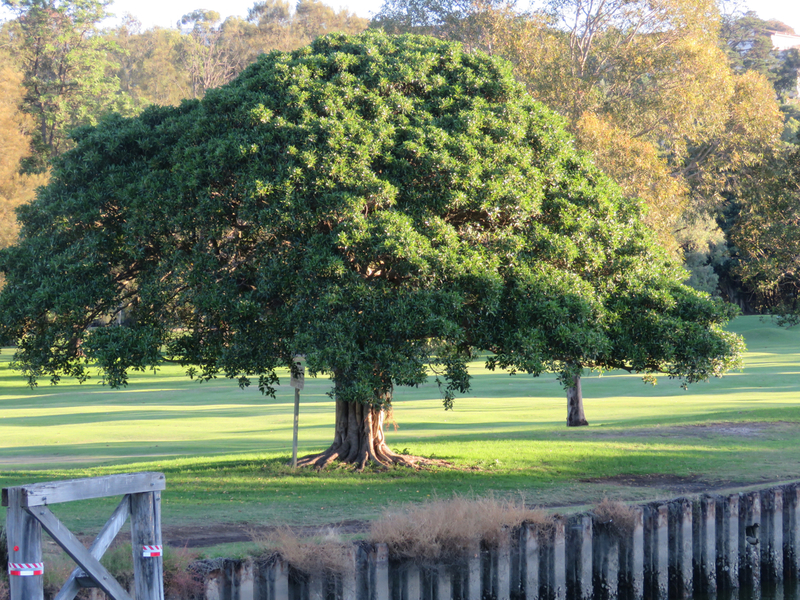 A lovely fig trees in Marrickville Golf Course. “Every year, between 3 & 4 million people around the world die as a result of air pollution & its lifelong impacts on human health, from asthma to cardiac disease to strokes. Each summer, thousands of unnecessary deaths result from heat waves in urban areas. Studies have shown that trees are a cost-effective solution for both of these challenges. And too often, the presence or absence of urban nature – & its myriad benefits – is tied to a neighbourhood’s income level, resulting in dramatic health inequities. In some American cities, life expectations in different neighbourhoods, located just a few miles apart, can differ by as much as a decade. Not all of this health disparity is connected to tree cover, but researchers are increasingly finding that neighbourhoods with fewer trees have worse health outcomes, so inequity in access to urban nature makes worse health inequities.” ~ The Nature Conservancy 2017. The report may have been about America’s urban forest, but it makes no difference. The findings are useful world-wide, including our little patch in Sydney’s Inner West. 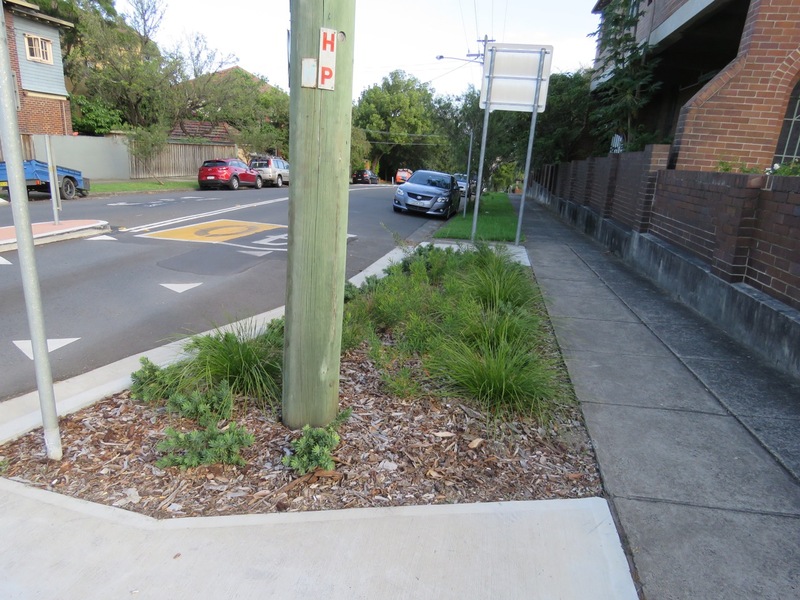 Leichhardt was the winner with a 20.3% tree canopy & 59.8% hard surfaces. Ashfield won second place with a 19.8% tree cover & 57.4% hard surfaces. 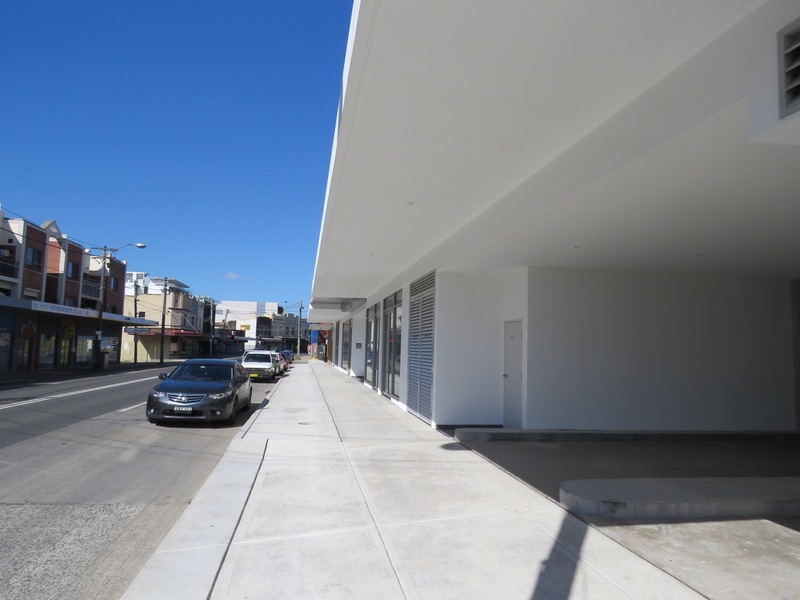 Marrickville came last with an abysmal 16.3% tree canopy & 63.4% hard surfaces. 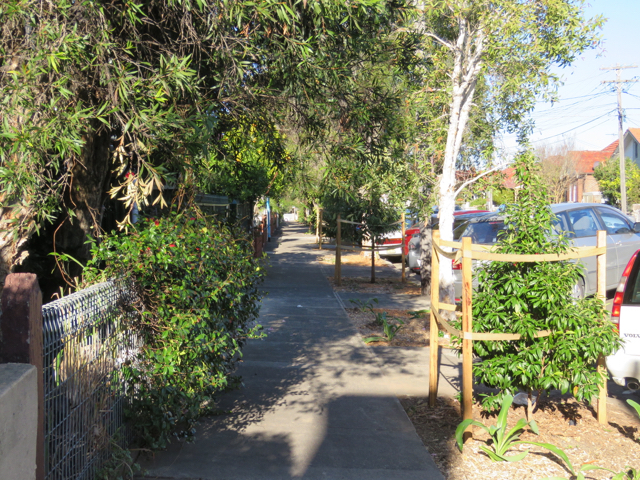 This is not to say Inner West Council – Marrickville are not planting trees. They are. They reported that they planted 1,000 street trees across the three former municipalities, which I think is not much & not nearly what is needed. Council also removes trees. Development is having an impact on the canopy & so is vandalism. WestConnex is having a massive impact on tree removal along its above ground route. I am not familiar with Ashfield, but having lived in the Inner West for the past 40-years, I am familiar with many of the streetscapes across the former Leichhardt & Marrickville municipalities. I look at street trees that have been there for more than my 40-years & this is a great thing to see. I am one of those people who love to look at trees. They make me feel comfortable. Treeless landscapes or skylines make me feel flat & oppressed. Recent research has found my response is normal. The research found that few trees in the landscape results in greater rates of depression & kids finding it hard to learn & retain information amongst other things. My wish for 2018 is for the Inner West Council to significantly increase funding for street trees, parks & other green spaces. If our area is to be made greener & healthier for us, then the number of street trees & park trees planted need to increase substantially. More trees please. It takes at least a decade for most trees to grow to a size where they have a visual impact, so if we are to get the amenity from trees like shade & clean air, then we need to get trees into the ground as soon as possible. I say “most” because I have seen how fast a Poplar takes to reach a significant height. These trees grow so fast you can almost watch it happen. No-one can deny that it is hard being out on the streets in this hot summer weather. I’ve been out most days & noticed that a lot of people are not coming out of their homes until 4pm or later due to the heat & lack of shade. We in the community need to do our bit too. We need to plant a tree or shrub in our garden if we have the space to do so. We also need to make concrete gardens a thing of the past & give stamped concrete driveways the flick too. These only make our house hotter & we pay higher power bills as a result. I was very impressed with Inner West Council – Marrickville’s free tree giveaway for 2016-2017. It is a terrific initiative & will build upon the urban forest. I hope the tree giveaway becomes a regular feature for National Tree Day. Community attitudes toward trees are changing. I have noticed more people like & want public trees compared to when I started this blog in 2009, which is great & something Council should capitalise on. With climate change making our seasons hotter, we need to make the changes that will cool down our streets & public spaces & planting trees is a major way to achieve this. Plus, trees are beautiful & soften the landscape. They make us feel good even when we are not aware of this. They help keep us healthy & happy & they bring in more wildlife. So, let’s make 2018 the year of tree awareness & get more trees in the ground. 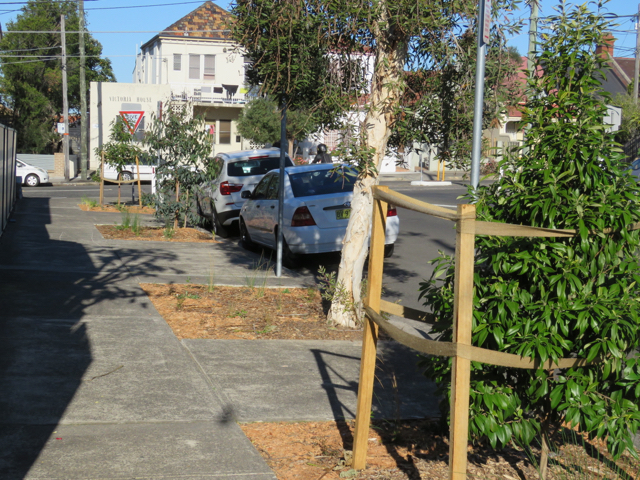 Council did well to plant a gum tree here in this perfect place on Myrtle Street Marrickville, but someone did not think so. It was vandalised 3 times….until it was dead. Thanks – not. This photo was sent to me by a local resident. As you can see, there is a significant amount of the canopy on the ground ready to go through the woodchopper. The tree that was pruned is visible behind the woodchopper. Thanks to the resident for allowing me to use this photo. It is the season of peace & goodwill & I would prefer to be writing positive posts. However, I am getting messages from distressed residents about Inner West Council – Marrickville’s tree pruning, so I need to write something. 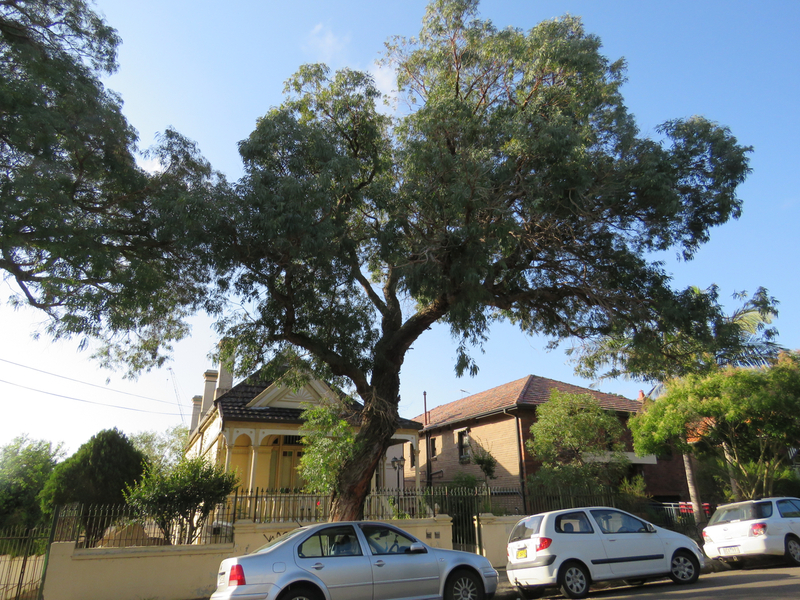 Inner West Council is currently pruning the street trees in Marrickville South. I spoke to Council’s tree pruners earlier this year, so I was surprised when they were back again so soon. 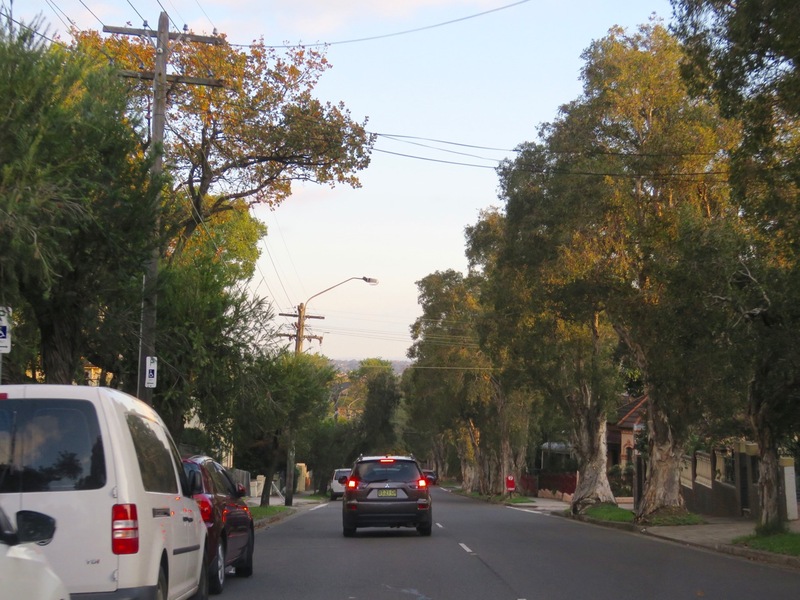 Our street trees get “managed” from all directions – Ausgrid, development & Council. Vandals also do things to the street trees, though I am not suggesting that Council are vandals. Imagine having three groups coming on a regular basis to give you a haircut & maybe lop your ears off. It is no wonder so many street trees look unattractive. My observation with pruners is that they come once to prune. The next time they come they take off more branches that were deemed okay the last visit & no, they haven’t grown so much to be noticeable. Ausgrid does this & over. In a very short time, the trees get reduced into a shadow of their former self. Ausgrid prunes the top & Council prunes the bottom. So, what is the problem? This is what has been relayed to me. 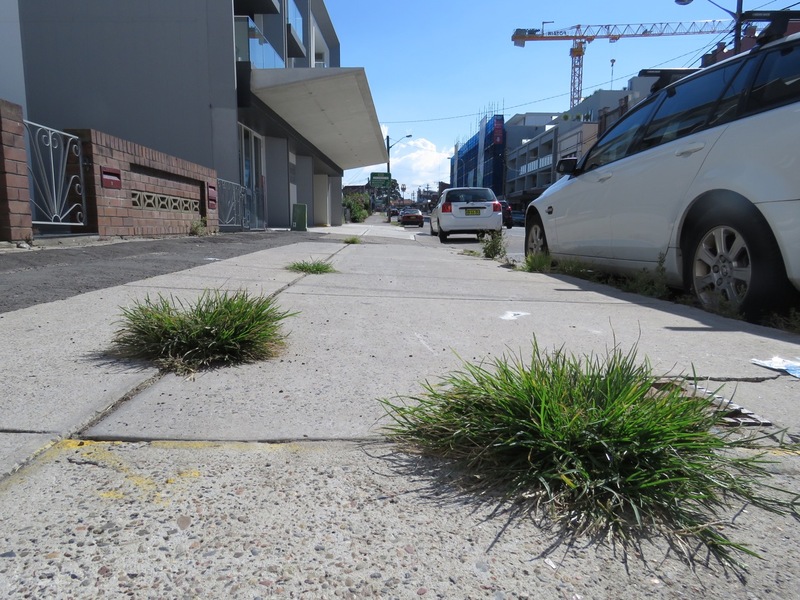 “I had no knowledge that this was happening today;… Apparently, they are pruning to Australian standards & to protect workers so grass can be mowed, and so footpath is clear & people can walk to their cars. [they] were saying most people want the trees cut out! !” Sounds reasonable except if you know the tree was not causing a problem to begin with. I know this tree. It was not intruding on the footpath, nor did it prevent people from getting to their car. What it did have was branches low down on the trunk & as far as I have observed, this is not acceptable by Council. “Contractor tried to tell me it’s not my tree & I have no right to protest it’s being trimmed; when I lovingly water it I feel I have some say in its up keep! And will continue fighting for it to live!!! !” The photo above will show you just how much of the bottom canopy of this tree was removed. The residents do not believe the trees needed pruning & if the tree did by Council’s standards, the residents believe that the pruning was excessive. It is heatwave conditions at the moment. The weather forecast for the next week is four days well above 30 degrees & five days of extreme UV index. It can’t be good for trees to undergo so much stress in these weather conditions. I recently learnt that trees can get sunburnt. We still have the really hot months ahead of us. The trees are in flower providing much needed food for wildlife & also beauty for the streetscape. Many people wait for the flowers on trees to bloom. Much of the flowers went into the woodchipper. Surely it is better to prune trees when they aren’t in flower. It would not matter so much if we had tonnes of food-producing trees across Inner West Council – Marrickville’s section, but we don’t. Bird-life would not be missing out on essential food supply. I downloaded their map & saw that Marrickville South is allocated June, the 6th month. It is December, the 12th month. 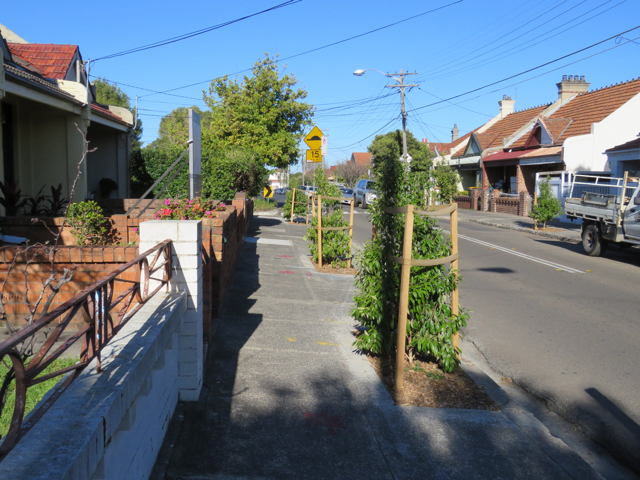 Enter the website via the Marrickville portal & they say they are doing street tree maintainance & list streets in Balmain. That’s a bit confusing. To finish, I do believe Council needs to ensure that their pruners do not over prune. 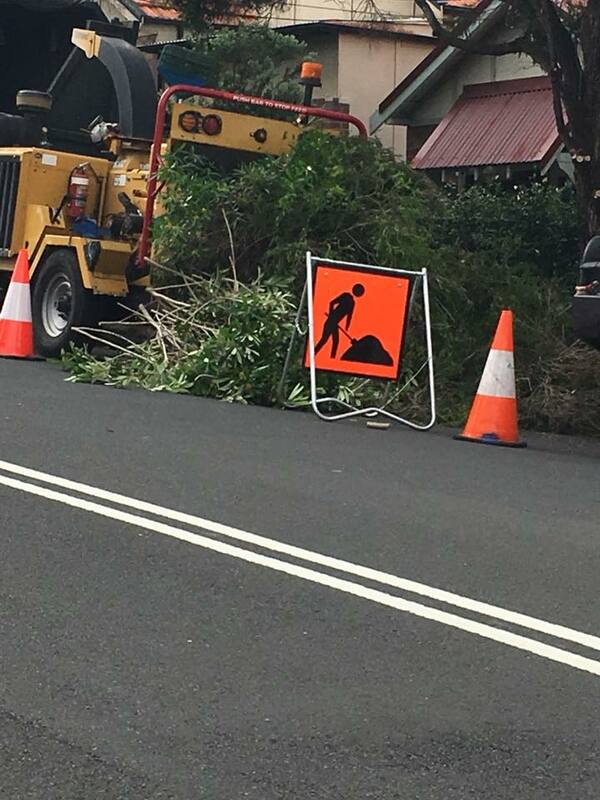 Council put up signs saying Ausgrid was over pruning trees. This was great & wonderfully supportive for the community who were reeling from the damage to street trees done by Ausgrid pruners. What is not so great is the community perception that Council are doing the same. BEFORE: Google street view of the tree that was removed. This image is a few years old, perhaps a decade. The tree was much taller, with a much larger trunk & a bigger canopy. AFTER: Photo taken today after all branches were removed. The top of the trunk is higher than I can reach. What is wrong with people? 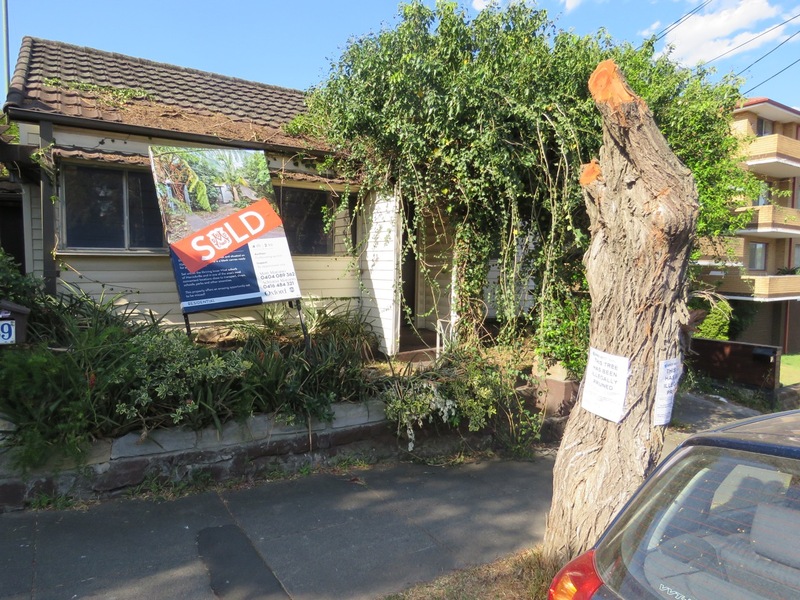 Late last week a mature Bottlebrush tree outside 89 Warren Road was unceremoniously chopped to nothing, but a trunk. It looks awful. It is one less tree in this street. It also is a waste of rate-payers’ money & a waste of Council’s work. 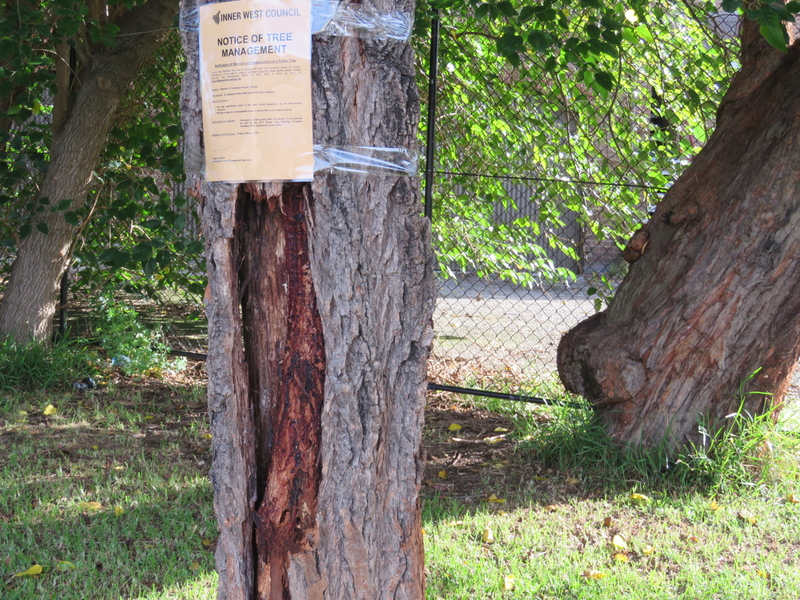 This vandalism has robbed the community of all the benefits this tree was providing. It was more than 20-years-old. 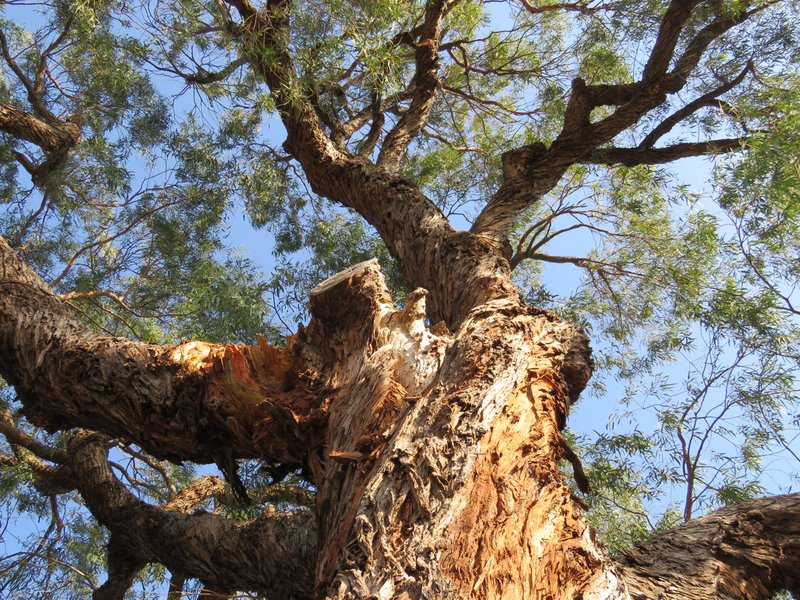 Local people have contacted me about this tree & they feel furious that the tree has been destroyed & they want the Inner West Council to replace it as fast as possible. A good street tree can add 30% to your property value. A street full of good leafy street trees is a real estate agent’s pleasure because all houses will sell for more than the same kind of house in the same kind of condition in a street that does not have street trees, or has poor quality street trees. Street trees provide a buffer from traffic & collect particulate matter pollution from passing vehicles. Without this buffer, that particulate matter pollution is much more likely to reach your lungs. Particulate matter causes lung irritation, respiratory illnesses & impairs airway function. It also can cause irregular heartbeat, heart attacks & premature death in people with heart or lung disease. It also collects on buildings. The shade of a tree can reduce air temperature by 1 – 8 degrees Celsius. The canopy acts as a buffer for wind & can reduce wind speed by 10%. A street tree can save up to $400 on your annual power bill. Trees are nature’s air conditioners & they cool down surface heat & lower the urban heat island effect. Trees also sequester CO2 & produce oxygen. Trees provide habitat & food for wildlife. People are happier when in leafy green streets. Since we have very little green space (the former Marrickville LGA had the least green space in Australia), the streets and the street trees are our green space, aside from parks. People are happier & have less depression when able to be around trees. So well done. 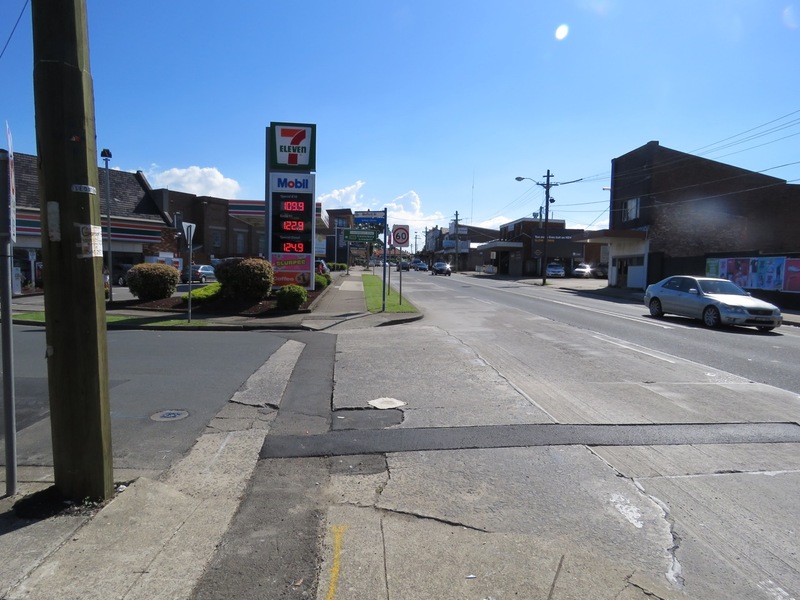 This is a busy street with both pedestrians & vehicle movement. It’s hot walking around there. The locals are angry with you. You did not enrich the streetscape. Instead, you destroyed part of it & this is a terrible way to treat both the tree & the community to whom that tree belonged. Shaw Street Petersham has not changed much since I lived here almost 40 years ago. I’ve always found it to be a beautiful street not only because of the houses, but because of the wonderful tall street trees. My very first experience of public green space is my street. ~ Dr Libby Gallagher. Associate Professor Michael Andreu – School of Forest Resources and Conservation at the University of Florida. Dr Libby Gallagher – Landscape architect and director of Gallagher Studio. Dr Lyndal Plant – Urban Forester Pty Ltd.
Roger Swinbourne – Technical Director at AECOM. Roger Swinbourne listed the following benefits of street trees – air quality, providing shading, biodiversity, water quality, winter temperature variations, average heat wave temperatures are all impacted by the quantity of trees we have in our cities. The study showed a whole other list of values the street trees provided. There is a strong link to the canopy and the mental health of the community. Canopy coverage also helps mitigate air pollution. Shade really matters. A canopy increase from 20% to 28% lowers the air temperature by 4-degrees & road/pavement temp by 14-degrees, which is pretty substantial. 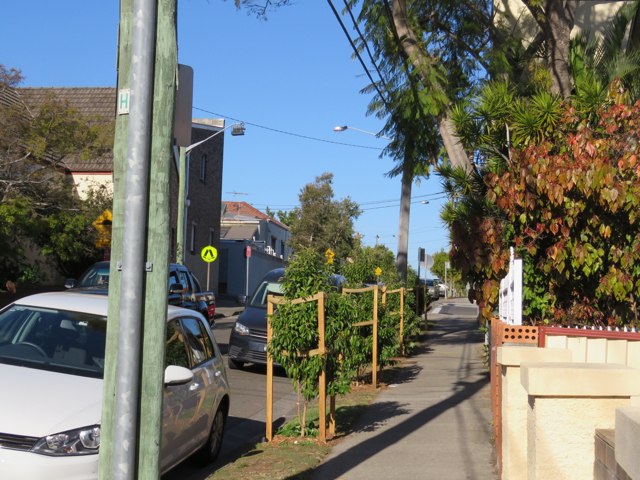 The net benefits of street trees outweigh the costs of infrastructure issues such as lifting footpaths. Dr Libby Gallagher did research in Brisbane that found that houses in leafy streets sell for higher prices, but how much higher was dependent on the amount of canopy cover those trees provided. The houses were 4% more expensive. An Australian property developer listed a good tree-lined street as number 1 of what people were looking for when buying. Then Dr Libby Gallagher spoke about the Cool Streets program held at Blacktown City Council. It was found that a mix of evergreen & deciduous & more trees boosted property & lowered electricity bills. Initially the residents chose small trees. After seeing the benefits of large canopy trees to their electricity bills & health, they chose taller trees & more trees more densely planted along the street. The residents also contracted to water and care for the trees. They took ownership of those trees because they helped plant them & because they know the significant benefits those trees will bring them once they have grown. Associate Professor Michael Andreu spoke about Tampa costing the value of all their trees, which came to a massive $35 million. He also spoke about development & trees. The city quantifying the urban forest allows everyone to understand the use of the trees & how much these trees contribute. It helps the city explain to developers why they cannot just chop trees down. The information they have about their trees allows them to include them in infrastructure planning. Singapore is one city that prioritizes their trees in planning. 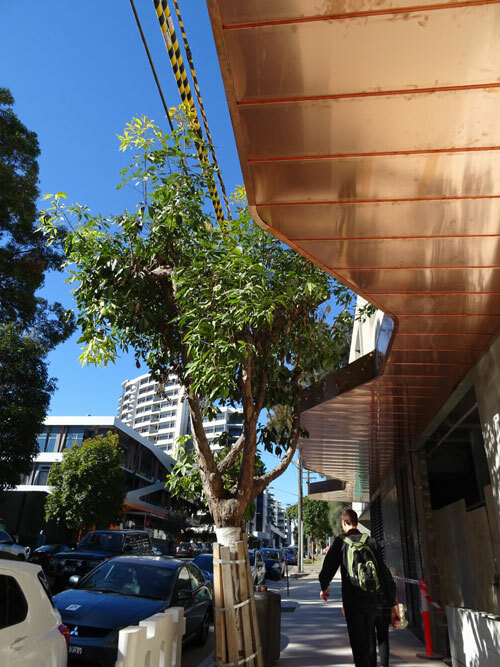 40-metre tall street trees in Surry Hills were given as an example of trees that would not be planted these days. Once these trees die they will likely be replaced by something much smaller & this is despite the enormous amenity these trees are providing now. With more development happening now, trees are not being recognised for their amenity that they provide 24-hours a day. I’ve been noticing that many of our street trees under powerlines have started to have dead parts in the canopy. 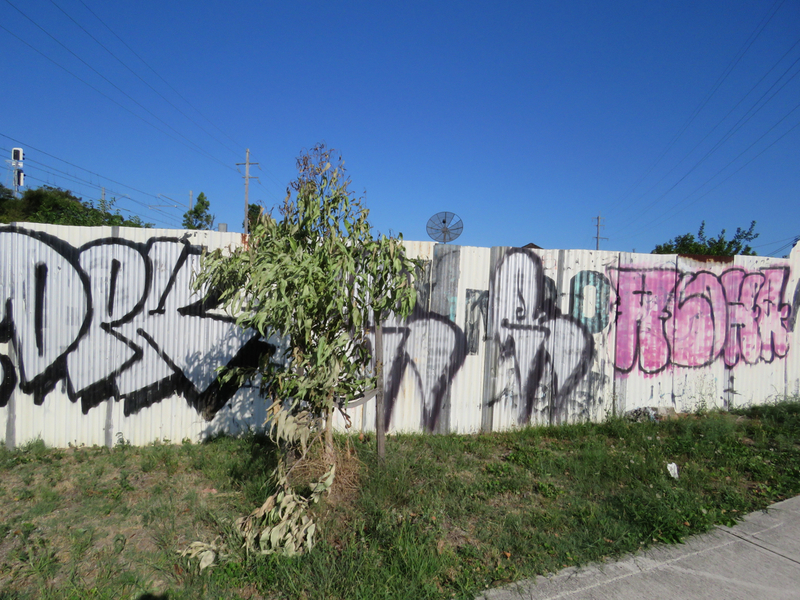 Two dead street trees in Marrickville – notable because they are beside each other. They died quickly. 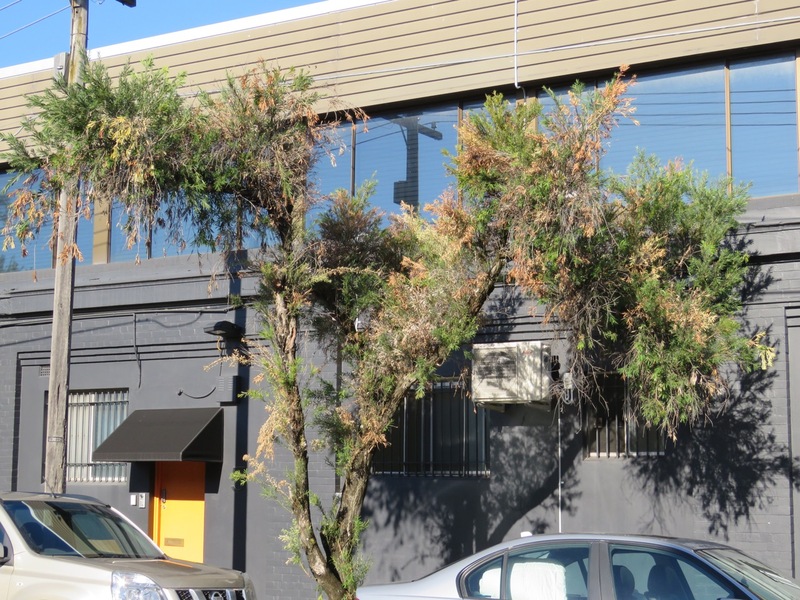 Inner West Council has given notice that they intend to remove a Narrow-leafed red ironbark (Eucalyptus crebra) opposite 6 Tramway Avenue Tempe. Tramway is a lovely street with lots of street trees. The tree to be removed is the one with the sign. I am glad that Council are replacing with another in this location. “Tree has significant crack in the main trunk causing it to be structurally unsound. Council says they will replace with a Red Iron Bark (Eucalyptus sideroxylon) as part of the 2017 Street Tree Planting Program between May & September. The deadline for submissions is Friday 3rd March 2017.